It started in my teens when a girlfriend and I were looking for a cheap way to entertain ourselves. We both loved to sew and play with old stuff, so we'd catch the old diesel train to the next town (and no, I ain't THAT old.....our train line was a bit antiquated, but so cool!) and pay a visit to St Vincent De Pauls. We had so much fun rummaging through the racks that now as an adult I can't give the habit up. And why would I when I find so many great treasures? So on my last trip I found 2 NEW vintage tablecloths. The one in the background of this picture has the most vibrant colours and design. 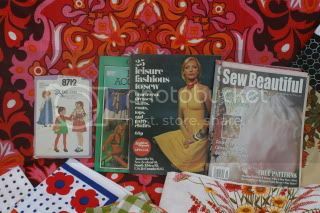 There was also a very cute old curtain which you can just see a bit of in the right hand corner, some new old napkins, a cute pattern and a couple of old books with some very funky bikini patterns that I'll try (after I get in shape!!). Oh, I haven't forgotten the quilt!! I have a few squares cut, but not really enough to take a picture and write a post about lol. I can't remember the past time I went to an oppy to shop rather than drop off donations. Not only because it jst isn't fun with 2 to 3 whingy kids who touch everything breakable but also because...ahem...I don't have anywhere to stash anything I bring home anymore. So I will live vicariously through you! Oh WOW look at that haul- I think somehow we have similar tastes!! I remember going to the local Salvation army when I was very small with mum - yes I started early.. although I did not pick it up again until in my twenties! I hope I haven't confused anyone!